At the closing session of Wikimania, someone asked “how many people solved a problem?” and got a huge round of applause. The problem-solving started on the Wikitrain, a specially arranged pre-conference group excursion on Amtrack’s Adirondack line from New York City to Montreal. The weather was perfect, and the onboard WIFI was unpredictable, so the 11-hour trip afforded a perfect opportunity to meet and relax with some of the volunteers and WMF employees. The pre-conference hackathon was another great opportunity to accidentally solve your problem-de-jour by happening to sit down next to the exact person who knew how to solve it, or failing that, the person who knew the person who knew, etc. and could introduce you to them within two minutes of framing the question. The hackathon also made use of the new Technical Code of Conduct. At the beginning of the event, organizers emphasized the importance of all attendees feeling welcome, and several individuals were introduced who could assist with any potential Code of Conduct issues. Wales surrounded by stuffed toys. A few new memes tried to gain a foothold. There were several goatification signs, but no one could explain this one satisfactorily. The stroopwafel seems safe, at least for now. The Wikimedia Cuteness Association was very much in evidence, and their stuffed toys had front row seats at both Katherine Maher’s keynote and Jimmy Wales’ annual State of the Wiki address. At the end of the conference, all was revealed, with a group photo of the cuteness association members along with their amanuenses. A full list of Wikimania sessions with any associated notes or videos is here. Links to videos of the livestreamed keynotes on YouTube are here. Further videos can be found on the Wikimedia YouTube channel. The new Board of Trustees had met before Wikimania to appoint new members and elect officers. Dariusz Jemielniak and María Sefidari were returning, and James Heilman rejoined the board; they had all been reelected. Wales and Heilman sat next to each other at the Q&A panel, and appeared to have patched up their differences, as they passed the mic back and forth answering questions. The most interesting talk by far was at Wiki Project Med for Internet-in-a-Box, from the same people who did One Laptop Per Child. This project takes all the medical information on Wikipedia and brings it to remote areas without internet connection. The cost has dropped from thousands (in back) to hundreds (with white battery pack) to $20 for the 2017 Android phone version (front). The earliest form of the project was a large box that contained a download of the Wikipedia medical articles and emitted a WIFI signal. Users who were close to the box could access the offline Wikipedia by a local WIFI hotspot. The next step was a smaller unit, about the size of a portable hard drive, with a separate power supply in a mass-produced white case. Finally a very small unit was designed that could fit in the hand, be accessed from an android phone, and utilize the cellphone battery as its power supply. As each smaller unit was designed, the price dropped exponentially. The cost of the initial WIFI hotspot box was in the thousands of dollars, the Android-compatible unit is around $20. The device can be kept up to date for a nominal fee by downloading most recent versions from within the same country, using local shops that that provide music downloads. Trials have been done at clinics in Guatemala and the Dominican Republic. It was standing room only for this session about the recently completed Technical Code of Conduct. There are session notes here, copied from here (etherpad), also slide deck. which is mainly topic headings, as the session was a roundtable. One concern that did not get listed in the notes was an objection to the term “victim”. Some of the participants felt very strongly that this defined them in ways they did not wish to be defined, and preferred the word “target”. For anyone who is following this topic closely, do look at the etherpad notes, for more about enforcement and potential use on other projects. Finally, there was a coloring book being passed around during the opening ceremony that had a drawing of Katherine Maher in it. The title was “Women of the commons: a coloring book” by UnCommon Women. For anyone who has been trying to track it down, the coloring book is now online as a PDF download at uncommonwomen.org. All the images together on one sheet are on Twitter. The mysterious Argentinian woman in the coloring book named “Scann” is @scannopolis on Twitter. 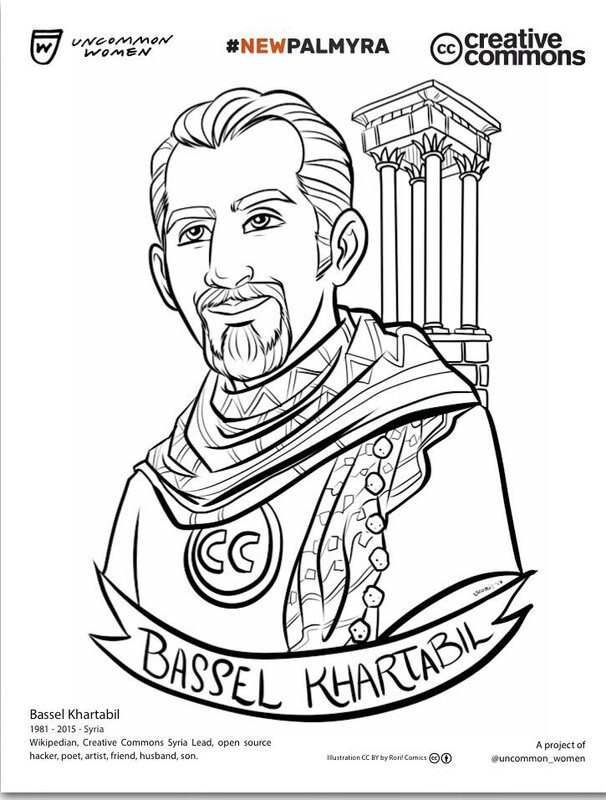 There is an image of Bassel Kharabil from UnCommon Women as well, but so far only a small Twitter image is available. Be interesting to know who was behind the colouring book. While I’m sure they had the best of intentions, as written up here, it comes across as more than a little creepy. If they were attendees, you might even say it was an issue for the newly minted Code of Conduct to rule on.